Countless security systems are on the market from which you can choose to implement with your Mac computer. You should not have a problem finding an Internet system that is going to provide you with what it is that you desire. Some of the top five security systems that are compatible with Mac computers are outlined below. The Y-Cam White SD system is loaded with features. Beyond being able to work with your Mac computer, it offers you the capability of monitoring your system on your smartphone. Since this system comes complete with a built-in microphone, you will be able to hear the audio at the same time as you are recording the video footage. All of the built-in equipment is sent directly to your Micro SD card, so you will always have access to it whenever you choose. Thanks to the implementation of this feature, you will not have to worry about using additional recording equipment. The system comes equipped with a built-in wireless connection, so you will never have to worry about connecting your equipment with an Ethernet connection.The system comes equipped with software that allows you to connect a total of 36 cameras into one unit. Another great feature of these cameras is that you are able to set them to record on a set schedule or whenever movement occurs. Cameras are a great way to monitor your children, keep an eye on someone who may not be feeling well at home or watch the pets. You have the option of mounting the cameras to the wall, ceiling or desk. Thanks to their sleek design, you can place them out of sight inside of your home. Regardless of whether you are a beginner or a professional, you will be able to set one of these cameras up in your home quickly and easily. Another great camera that works alongside your Mac computer is the Panasonic BL-C10. It comes complete with motion detection, an external input connection and one-way audio. This miniature camera is perfect for the office or home. It offers you a night view mode complete with color, so that way you are able to see even in the darkest of conditions. Not only is the camera affordable for just about every budget, but it is relatively simple to operate. Regardless of where you are on the planet, you can access the feed from your system using nothing more than an Internet connection and your computer or smartphone.Since it comes equipped with wireless connectivity, you will not have to worry about using any Ethernet cables. The compatible recording platform will work alongside any Mac computer with Security Spy software. The PoE unit helps to utilize the Ethernet connection to power the device. You can set the camera up without having to worry about any conventional methods of connection. Thanks to the external input, you can plug in a device that allows you to be alerted when the alarm is triggered. This can be extremely useful for adding this feature to your doors and windows. You can use this feature for monitoring pets, children or anyone else on the inside of your home. This particular type of camera comes equipped with a PIR sensor that is integrated into the device for detecting movement, regardless of how light or dark it is outside. Whenever the sensor detects movement in the area, it will illuminate an LED light that will focus on the area throughout the recording process. Small businesses and offices will love being able to integrate this system into their business. With two-way audio, you will be able to record interactions between the recording and the viewer.Everything that you need to watch the live feed on your computer comes with this package. Your camera comes equipped with a microphone, software and speaker to help provide you with the recording you desire on your Mac computer. Since it connects wirelessly, you will never have to worry about using an Ethernet cable. 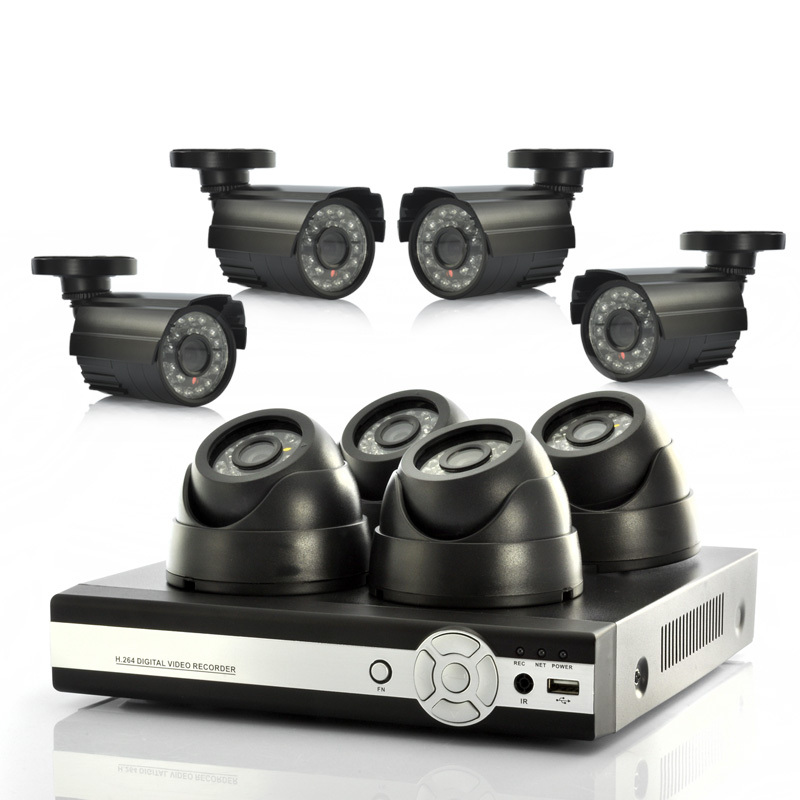 The video can be stored and viewed efficiently thanks to the video compression.Panasonic BL-C140Panasonic BL-C140 outdoor security system comes with a powerful 10x digital zoom. It comes equipped with a casing that you can use for mounting the system outdoors. The system works perfectly for monitoring your garage, driveway or anywhere else around your home. The power unit connects with an Ethernet cable for powering the camera. Alarm features allow your camera to send imagery through email or FTP whenever an alarm is set off. Thanks to an easy to use interface, you will be able to set the camera for periodic transfer or motion detection. Depending on where you decide to use the camera, you have the option of both indoors and outdoors. Monitoring the video feed from your computer through the Internet has never been easier. Its recording platform accommodates the software found on Mac computers. Its power unit makes it easy to place the camera around your office and home. This bullet camera is compatible with any Mac computer. It comes equipped with high-definition capabilities to provide you with an amazing picture. The camera is perfect for those instances where you need a greater level of detail. When it comes to identifying people, you will never have to worry about that with this camera. The camera can switch from color into black and white for viewing images in the evening. It comes equipped with 720p technology and 30 fps with one megapixel resolution.Thanks to a weatherproof housing on the camera, you will not have to worry about it getting damaged from the elements. You can choose from amongst wired or wireless for your connection preference. Its two-way audio allows you to communicate between the user and the field of view. Using this camera around your home is ideal, but you can also implement them into your business or parking lot. Thanks to the Micro SD card, you will be able to store all of the footage safely away. Video equipment allows you to take advantage of wireless technology with some of the latest models on the market today. They come equipped with a transmitter that transmits the video signal through the air and into a receiver. The wired cameras end up sending the signals through your wired technology. You will find a number of different wireless cameras that offer their own distinct set of pros and cons. Most of the wireless cameras are able to work by being plugged directly into your power outlet. Some of the cameras can operate on a battery pack alone.The battery powered camera is only going to last for a few hours before you are going to need to charge it up again. They have a built-in transmitter for sending your video feed back to the camera. Its transmitter will send all of the video that the receiver has picked up throughout the day. Your receiver will need to be connected into a monitor or DVR. You can purchase a receiver that has built-in storage, while some of the other cameras are going to need a DVR for storing all of their video feed.Two basic types of radio signals are digital and analog. An analog signal is capable of being picked up with receivers that are tuned into the same frequency. Anyone who has a tuner that is properly tuned will be able to receive the transmission. Analog systems will frequently deal with interference issues, so you will want to take that into consideration before making your purchase. Whenever you have more than one transmitter, the one that has the best signal will be the only one that is going to receive the signal.Digital cameras are a lot more secure because their frequencies are cycled to help avoid any potential interference. The receivers need to be paired with the camera for the video to record. They will need to be programmed to go through the various frequencies at identical speed rates. Wi-Fi cameras that are wireless use an Internet protocol to connect with the Internet. These cameras allow numerous devices to work together on the same network.Local area networks are established with a wireless router. They allow the camera to access the network. Make sure your router is going to have the correct amount of bandwidth to support all of the various devices that you have connected to your system. Some of the systems do not come equipped with the router, so you may have to purchase it individually. Thanks to their ability to offer remote access, these systems have become quite popular.Depending on the type of system you get, installation may be a little more difficult than anticipated. In that instance, you will want to enlist the help of a professional installation company to come out and do the job for you. Trying to install the system on your own can end up costing you a lot of valuable time and energy. It is imperative that your installation is properly completed, so that way you can ensure your system is properly working right from the start. The 3G cameras on the market today come equipped with a built-in transmitter that enables them to install a cellular camera. This particular camera will allow you to connect through a cellular network for sending video.They function in much the same manner as the Wi-Fi cameras. Depending on the strength of your cellphone network, the signal and reliability is going to vary. You may need to end up purchasing a special plan for this type of monitoring to work properly. The equipment can also be expensive for your system to work properly. Security cameras are an integral component to any home security system. Installing an outdoor system will help to improve upon the security of your home. Place these cameras around your doors and windows for optimal security. You can also install them around the entryways to your garage and other outdoor structures. They will help make an intruder think twice before attempting to make their way into your home. If you don’t have the extra cash to invest in an outdoor security system, you may want to consider the dummy cameras as another alternative. Not only do they look real, but they will help to fool an intruder and make them believe they are the real thing. Combine real security cameras with these dummy cameras to help enhance the look and feel of the security system around your property. Some of the dummy cameras come with the LED lights that make them hard to determine if they are the real deal or not.Wireless security systems are a great way to add another layer of security to your existing system. They will help detect any potential movement in the driveway. You will need a transmitter and receiver that work alongside each other to ensure adequate monitoring of the area. The transmitter will help to detect any heat or movement, which then sends the signal through to the receiver to begin the recording process. You also have the option of programming the system to send off an alarm whenever the system is triggered.Window and door alarms are another great option for detecting glass breakage or movement. They will send off an alarm when they have been activated. A doorstop alarm will also send a signal whenever the door is attempted to be opened. Families that have a swimming pool in their backyard will benefit from these alarms when it comes to keeping their children safe. You can purchase these items in both wired and wireless versions, so you are in complete control of what you want to install around your home. Wireless are a lot easier to install, which make them the most popular choice for homeowners. Don’t just sit around and depend on someone else to protect your home. Take control of your home security system today. Don’t hesitate to contact us if you have any questions or doubts.